Drug Use in schools is at an epidemic proportion! Suspicious about your employees using narcotics on the job? We offer monthly narcotic sweeps that keep your employees on their toes. Insist on a zero tolerance policy for your work site! According to Tom Robichaud, all illegal drug users lie. Proving they lie has become his career. “People who do drugs, they lie,” Robichaud said. “My job is to prove to parents and employers that they are lying.” In January, Robichaud started up his company, Discreet Intervention. For the past 25 years, Robichaud has worked in the dog training business. As a personal dog trainer he has taught police dogs and basic obedience classes. His newest endeavor allows parents and employers to contact him for a private canine drug search, if they suspect illegal drug use. “It’s all legal and I’m very discreet,” he said. If drugs are found on the property during the search, he does not have to report it to the police, he said. “I don’t do a physical search, the dog does a passive search. I then tell the parents where the hit is and the parents are the ones to find it,” Robichaud said. Tom and Ben are featured in a great article in the Wrentham Community Guide. 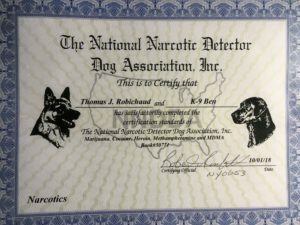 Located in Wrentham Mass, Discreet Intervention K9 drug detection services are available throughout Massachusetts including the Greater Boston Area, Rhode Island, and New Hampshire. 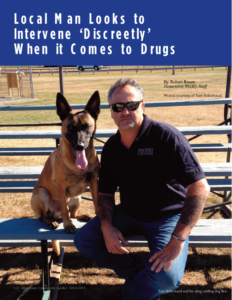 Discreet Interventions occasionally offers drug dogs for sale. Please get in touch for more information.